Is your morning coffee an okay option on your healthy eating plan? If coffee really bad for you or is it actually good? 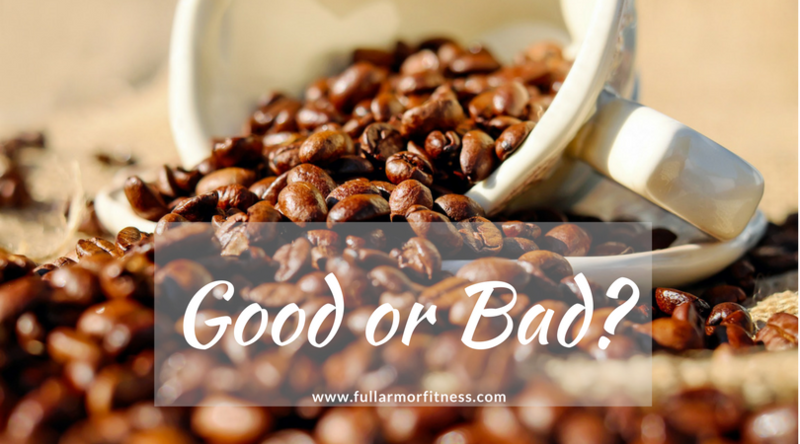 I get these questions about coffee and health all the time and as a coffee drinker myself, it is smart to take a look at both the good and the bad. Now, I’m not here to tell you that coffee is good for you. If I did, I would be telling only the good side of the story and I’m no politician. I am here to give you the good and the bad and tell you how you can incorporate your favorite coffee or tea into your healthy meal plan. Most coffee and tea contains a lot of caffeine. This is usually the primary reason people make coffee their drink of choice in the morning. Caffeine is a drug like any other and comes with a long list of side effects. Have you ever tried not having your coffee in the morning? Yeah, pass the Excedrin, right? The headache that comes on when you try and kick this habit can be brutal (just like with other drugs) and creating a dependency and addiction like this is harmful to the body. Second, coffee is extremely acidic. Our bodies function at optimum levels when they are slightly more alkaline (the opposite of acidic). It is best for us to greatly reduce any foods that will drive our body’s pH to be more acidic and eat more foods that are alkaline (like fruits and veggies). An acidic body pH is like a magnet for all kinds of illnesses. Also, an alkaline body has a much stronger immune system, making illness much less likely. Last but not least, the caffeine in coffee and tea is abuse to your adrenal glands. Your adrenals release your “fight or flight” hormones basically giving you a nice “boost” when needed. Unfortunately, people who drink coffee all day long are consistently beating on their adrenals. This is the equivalent of whipping a tired horse even when he is exhausted. Eventually he will not move at all. Many studies have shown that coffee can help in the prevention and treatment of diseases and illnesses as varied as Alzheimer’s disease, diabetes, liver disease, skin cancer, Parkinsons’s disease and more. Although, I don’t believe coffee would be the cure all to any of these diseases, many ancient cultures did rely on the coffee bean to cure a long list of ailments. Not to mention, small doses of caffeine can increase performance and mental focus. Green tea is also a great drink to include with a long list of benefits. If nothing else, green tea is a wonderful source of antioxidants which are important in cancer prevention. Green tea has even been found to raise metabolism and aid in fat burning. Before you go take a green tea bath, its effects are really minor when compared to the effects of sound nutrition and exercise plans. Now that I’ve said that, don’t think you can eat junk food and just wash it down with green tea! What is a coffee and tea drinker to do? 1. Limit your coffee and tea intake to 2 – 8 oz cups per day. No, not 2 of each, 2 total. Any more than that is considered as a heavy addict. (I know. I’ve been there). 2. If you are currently dependent on a lot of caffeine each day, replace 1 or 2 cups of coffee with green tea instead. Green tea has much less caffeine than coffee and will help combat the ugly detox symptoms. 3. Do not jack up your coffee with sugar, milk, syrup and whip cream (So I guess that means no Starbucks, huh?). Use stevia or xylitol to sweeten and avoid all the empty, harmful calories. A teaspoon of half and half won’t hurt either. Please oh please, do not use any of those flavored creamers. They are closer to someone’s chemistry experiment than they are to real food. 4. Make sure to make your food choices healthy. Avoiding other acidic foods like sugar, artificial sweeteners and processed foods will lighten the acid load on the body. 5. Make sure the coffee you drink is organic. Conventional coffee is filled with pesticides and chemicals and should be avoided at all costs. There is no need to give up your morning coffee but it is important to drink the right types of coffee, without the added unhealthy extras and, as with most things, in moderation. Get started on your own weight loss goals right away with these Healthy Weight Loss Meal Plans.